BIG ANNOUNCEMENT: Romance Yourself in 2015. It’s been wonderful to hear from so many of you who have said that 2015 is going to be the year you start really loving yourself. No matter what your big dreams are or what resolutions you’ve set, the key to designing the life you desire is a solid foundation of self-love. When you’re head over heels for yourself, you walk around wrapped up in love all of the time. You start being your own darling, so instead of relying on other people to make you happy, joy flows freely from inside of you. And pretty soon, contentment and gratitude begin to permeate every area of your life. The world opens up. You start taking real responsibility for your life and things you’d have never thought possible are now within reach. But I’ve heard time and time again that you’re struggling to get started. You know self-love is important, but how do you make it more than an amorphous concept and start practicing it in your own life? That’s why I’ve created Romance Yourself: A 40-Day Journey to Self-Love. This ecourse is built around a daily practice that I know will help you spark a lifelong love affair with YOU or rekindle the romance if you’ve been neglecting yourself a bit lately. But it’s also an adventure in self-exploration, falling in love with yourself, and creating the life of your dreams. I designed Romance Yourself to help you build a toolbox of strategies and exercises to deal with any situation, so that you can drop your fears, get clear on what you really want, and attract everything you desire. A love letter from me, introducing you to the course and sharing my thoughts on self-love. An outline of the daily practice, tips for incorporating the exercises into your routine, suggestions for personalizing your self-love practice, and additional resources. An MP3 morning pep talk to set the tone for the day, tune into a feeling of gratitude, and have you hopping out of bed with a bounce in your step. A video of a guided kundalini meditation for creating self-love. Daily e-mails throughout the course with lessons on various aspects of self-love and a journaling prompt to help you crystallize your own thoughts and figure out how this all relates to you. An MP3 deep relaxation for reflecting on your day and going to sleep in a calm, loving state of mind. The daily practice has been divided into bite-sized chunks so that you can easily fit them into your day and you’ll get lots of guidance from me for getting the most out of the course. Like I said in Friday's post, we are what we do consistently. By going on this journey you'll start changing the way you think, create new habits, and make loving yourself your new reality. 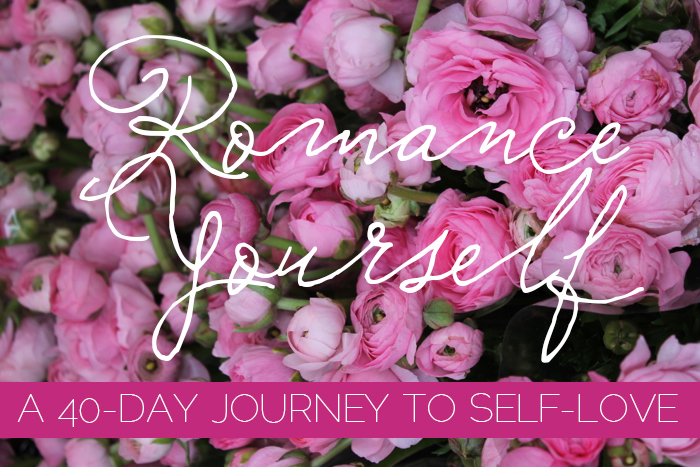 Romance Yourself doesn’t officially launch until Sunday January 11. But I want to do give you the opportunity to pre-order at a special introductory rate. Normally the course will cost £23, but if you order by midnight EST on Saturday January 10, you can get the whole thing for £17. Plus, anyone who signs up at this early bird price will gain access to a private Facebook group. I’ll be posting some bonus content and we’ll all go through the course together, sharing inspiration, responses to the exercises, and you’ll have the opportunity to ask me any questions you’d like. That means you’ll have a whole group of accountability partners romancing themselves along with you. If you sign up at the pre-order price you’ll receive your course materials and first email on Sunday January 10. Otherwise, they’ll be available as an instant download and you’ll start receiving the e-mails right away. I can't wait to take this journey with you. When I decided to love myself, my whole world changed. My life started opening up. I started taking risks and making my dreams a reality. I’m a happier person these days. And when life gets difficult, I have the tools to turn things around. You're a dazzling human being who is capable of great things and you deserve to feel like it. The life you dream of is within reach and it all starts by romancing yourself. Let me show you how. Newer PostThe First Step Forward. Older PostCreating a Magical Daily Practice You Love.